Texas Hill Country marquee camp T Bar M partnered with Waldo Photos in the summer of 2017 to use facial recognition to find camper photos and then deliver them to parents via text message alert. Read the camp software case study below to see how the product added value to their camp experience for both administration and camp families. To help raise additional funds for scholarship programs at the camp. $14.99* per camper per week optional service where parents pay for photo service, with 25% of revenue going directly back to camp. If the camp chooses to point Waldo revenues at a charity or scholarship fund, Waldo matches the 25% and provides a 50% revenue share. “Fundraising was a big part of why we wanted to work with Waldo,” said Alice Myer, director of marketing at T Bar M Camps. 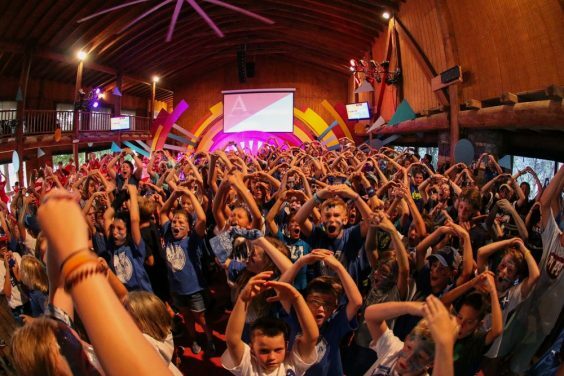 Through the initial pilot summer partnership with Waldo Photos, the camp was able to reach their goal of $75,000 for their Bless a Coach scholarship program, which provides a gift of $500 to each camp counselor for college expenses. Waldo Photos provided T Bar M with turn-key marketing materials that required minimal additional effort for the camp. Waldo provided T Bar M with an HTML email that went out to parents explaining the new Waldo product, featuring the product video. Waldo provided another email for parents that T Bar M sent out to campers two days before their session started to remind them about the new optional photo service. Waldo provided cards to the camp to hand out as parents dropped off their campers that quickly explained how parents could sign up for the optional service. As soon as parents dropped their children off at camp, the camp photographers started snapping photos, which were uploaded into Shutterfly and then migrated to the Waldo cloud via a Shutterfly API. This meant no additional upload work was required by staff photographers. Once the photos appeared in the Waldo cloud, Waldo matched each camper headshot (submitted by parents) to the photos in the album, then delivered the photos via text alert (right). It didn’t take long to see the benefit of the Waldo admin dashboard, which provided the camp with photo analytics on each Waldo subscriber–for example, how many photos were taken and delivered for each camper. “The Waldo team is responsive, customer-focused, and fun,” said Myer, who worked closely with the Waldo staff during this pilot program. Waldo provided a specific email helpline for all T Bar M enrollees in case they experienced any issues, with Waldo representatives available for 24-hour coverage.